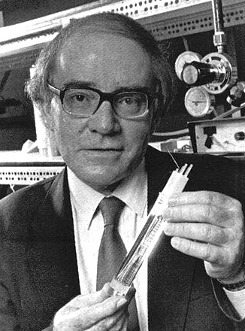 Martin Fleischmann was an electrochemist famed for his 1989 claim to have discovered cold fusion. At a press conference in Salt Lake City, Utah, Fleischman and co-researcher Stanley Pons reported that a table-top glass cell filled with heavy water and fitted with a palladium electrode radiated so much more energy than originally pumped into it that it had to be the result of a nuclear reaction -- a cold nuclear reaction, given that it was not accompanied by huge emissions of harmful particles. Excitement over the announcement soon turned to skepticism and then anger and ridicule, as experiments to duplicate the discovery produced shaky results. Unable to guide their peers to consistent duplications of the experiment, the two previously respected scientists found themselves blasted as unprofessional, possibly incompetent, and perhaps even out to make a fast buck. Cold fusion, once heralded as the answer to global warming and the energy crisis, was labeled quackery and largely abandoned. The cold fusion announcement of Pons and Fleischman is often referred to as a "classic" example of what not to do as a scientist (especially the act of bypassing publication in peer-review journals to make media announcements). The bad press eventually drove Fleischman and Pons from their positions in the chemistry department at the University of Utah. The pair was offered a position in a French lab organized by Minoru Toyoda (whose family owns the Toyota Motor Company). The pair worked in the Provence facility from 1992 until 1995, when Fleischmann retired, telling Physics World that he was fed up with his research ideas being ignored. At age 68, Fleischmann returned home to Tisbury, England, but remained active in international conferences related to his work and collaborated with scientists both in the UK and in Italy, trying to set up a cold fusion program. Not long after Fleischman's retirement, the overall scientific evidence of the original experiment at last shifted -- at least 50% of experiments duplicated his results, showing the anomalous heat reaction. More recently (March 2004) the U.S. Energy Department agreed to take a second look at the evidence for the cold fusion techniques originated by Fleischman and Pons, saying that the accumulated body of evidence made such a request "reasonable". Fleishman's cold fusion work was lampooned in Robert Park's Voodoo Science: The Road from Foolishness to Fraud (itself criticized as unscientific), Cold Fusion: The Scientific Fiasco of the Century (1992, John R. Huizenga), and Too Hot To Handle (1992, Frank Close). Fleischman and Pons' work was featured in the 1999 documentary Cold Fusion: Fire from Water (narrated by Star Trek's James Doohan) along with that of various other cold fusion experimenters.